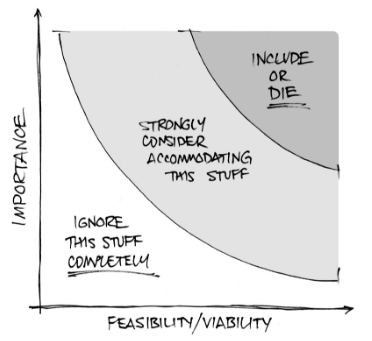 Enterprise UX, as we all know, is defined by a unique set challenges. Whether it’s lack of collaboration, legacy systems, or poor UX maturity, enterprise products can quickly accrue design debt and inconsistencies. 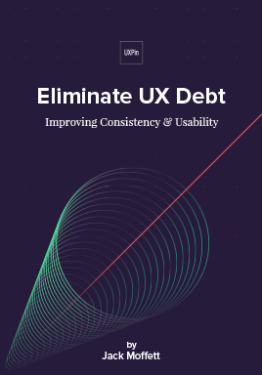 That’s why our partners at UXPin teamed up with EUX 2016 theme leader Jack Moffett on a new free e-book: Eliminate UX Debt. Jack’s book aligns perfectly with our conference’s Day 2 theme “Designing Design Systems” (which Jack moderated). Check out an exclusive excerpt below, or go ahead and grab your copy right now. Once you’ve identified and prioritized your design debt, the next step is to work with product management to get it into your release schedule. Agile is so popular these days that it seems like any process that isn’t Agile is labeled “waterfall.” I find that to be a bit dismissive. There are degrees of being Agile, and you can have an effective, iterative process that doesn’t involve stories, scrums, and sprints. For our purposes, however, I’ll address all non-Agile processes at once. Then I’ll make suggestions for Agile teams. Your work is likely planned based on a release cycle. Your organization decides what will go into the next release based on criteria such as how long the development effort will be; how badly a feature is needed by customers; what will sell; what bugs exist and how bad they are; and so forth. I recommend handling UX debt issues as bugs. The real benefit of this approach is that debt items can be entered and tracked using the same tools and business processes as bugs. This will ensure that they get reviewed and treated equally. A representative from the UX team on the issue review board should prioritize items, ensuring that usability issues get the full weight they deserve. Ideally, a representative from the UX team will also work closely with product management when releases are scheduled. When a particular part of the application is being scheduled for work, check it for UX debt. Would it add much effort to address the debt at the same time? Often, there will be savings simply because the code is already being updated by developers. Even if it’s a low-priority item, take advantage of the opportunity to pay down some debt. 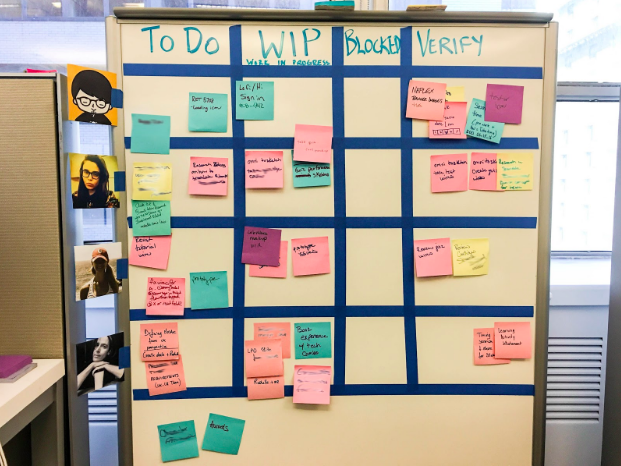 A company that employs a healthy Agile process shouldn’t have any problem prioritizing debt with other types of work, assigning it story points, and fitting it into sprints. In my own experience, however, Agile has been embraced as a way to get more work done faster, rather than as a method of iterative improvement. In such situations, you may have a harder time scheduling UX debt because (as management sees it) there’s not enough time to fit in everything they aim to wrap up, so there certainly isn’t time for all those trivial corrections you’re asking for. Photo credit: Laura Kershaw. Design process at Kaplan Test Prep. If you find yourself in such an environment, your goal should be to find a rhythm for addressing debt. Propose a certain number of story points per sprint (or every other sprint). Or, perhaps a sprint could be devoted to addressing debt at some regular interval (payback sprint). This should be done at least until the backlog of historic debt—your debt inventory—has been handled. Then it should become easier to keep up with new debt that crops up without that regular schedule. For even tighter schedules, consider holding a Cheese Day to knock out as much debt as possible. Management is almost always receptive to a one-day workshop every 60 days where you knock many items off the debt list. 1. About 2-4 weeks before Cheese Day, create the project in your app of choice (Asana, Trello, Basecamp, etc) and encourage everyone from customer support to developers and designers to briefly describe product annoyances. 2. Prioritize the cheese list based on the advice in the below chart. Separate the “Quick Wins” from the “Nice-to-Haves”. 3. Schedule 6-8 hours for the Cheese Day, inform everyone of the date, then dive right into the “Quick Wins”. Everyone will feel productive, and you’ll have progress to show management at the end. After prioritizing your debt, the next step is to work with product management to get it into your release schedule.